To help determine the ages of the four whitewash layers, sample SB-Arch-4 underwent additional testing to analyze the composition of each layer. When the tests were completed it was found that the third and fourth layers contained carbohydrates and that all but the second layer was originally mixed with an undetermined protein. These tests suggested that the whitewashes were applied during at least three different time periods. Furthermore, Susan Buck also found reddish dust between several of the layers that appeared to match the red clay soils surrounding the Mansion. This evidence strongly suggested that the layers were applied in stages since it would take time for enough dust to accumulate on the columns to be seen in the sample. Because all four washes were applied to a thin layer of white plaster, it was beginning to look like the columns had been painted white while President Madison owned Montpelier. 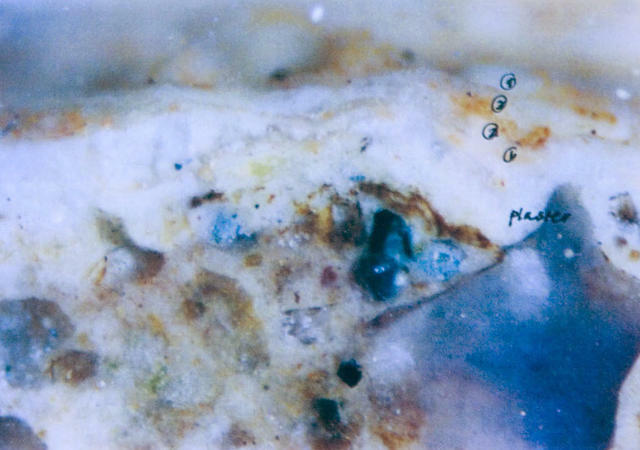 A photomicrograph taken of sample SB-Arch-4 showing four layers of whitewash.